Marshadow (Japanese: マーシャドー Marshadow) is a dual-type Fighting/Ghost Mythical Pokémon introduced in Generation VII. Marshadow was officially revealed on April 7, 2017. 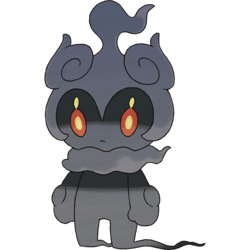 Marshadow is a gray, bipedal Pokémon. The area around its face resembles that of certain headgear such as a helmet with three horn-like protrusions on top. It has a bulb on each arm as well as a collar that wraps around its neck. Its eyes are orange with yellow pupils. Above each eye is a spot that is the same color as its pupils. It has two trails of shadows coming out from behind its legs. When angered or attacking, such as using its exclusive Z-Move, Marshadow's fighting spirit will begin to burn, causing it to become Zenith Marshadow. In this state, its headgear, bulbs, and collar flare up and change to a forest-green and yellowish color. Marshadow's eyes will also flare up when in this state, but do not change in color. Very few people have seen it, so its existence was the stuff of legends and myths. A cautious Pokémon, Marshadow sinks into the shadows to ensure it is not noticed while it observes its surroundings. Marshadow is known to hide in the shadows of others in order to become stronger by copying their power and movements. As seen in the anime, Marshadow is capable of causing nightmares. Marshadow is the only known Pokémon capable of learning the move Spectral Thief and exclusive Z-Move Soul-Stealing 7-Star Strike. Marshadow debuted in a major role in I Choose You!, where it was revealed to be a guide from the shadows who leads those chosen by Ho-Oh to be the Rainbow Hero. Marshadow made its main series debut in The Dex Can't Help It!, where Rotom wanted to record its data, but couldn't due to it not being inside its Pokédex. Another Rotom inhabiting the Pokédex managed to take a blurry picture of the Marshadow, but deleted it afterwards. A Marshadow appeared in I Choose You!. 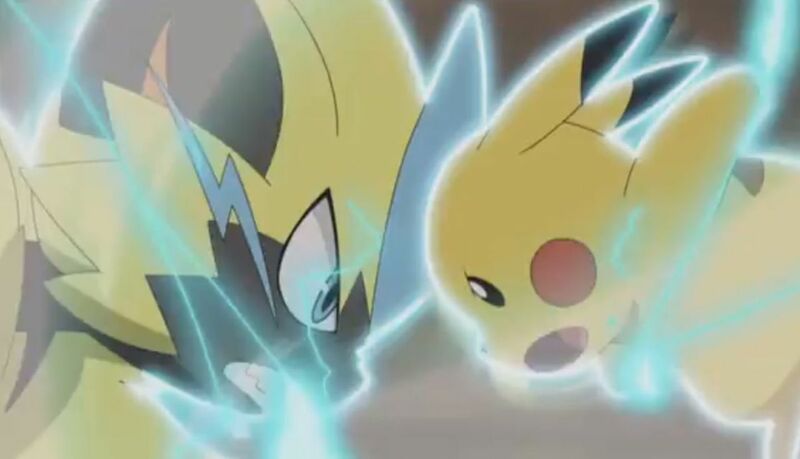 Pokémon Movies or Pikachu the Movies are animated films set in the Pokémon universe. There are currently a total of twenty Pokémon movies released. The Pokémon movies are all canon to the TV series because Ash and his friends' Pokémon were evolved or caught. New movies are released each year during the summer in July and they are released at varied times of the year in the dub. Below is a list of the Pokémon movies and the shorts that go with them. Pokémon the Series: Sun & Moon - Ultra Legends is the twenty-second season of the Pokémon anime and the third season of the Sun & Moon series. It features Ash Ketchum, his Pikachu, and their friends Lillie, Mallow, Lana, Sophocles, and Kiawe as they continue their quest in the Alola region. 1043 SM093 Lillier and the Staff! 1044 SM094 A Haunted House for Everything! 1046 SM096 Don't Ignore the Small Stufful! 1047 SM097 No Stone Unturned! 1048 SM098 Bright Lights, Big Changes! 1049 SM099 We Know Where You're Going, Eevee! 1050 SM100 Battling the Beast Within! Pokemon.id adalah adalah media website Pokemon Indonesia, segala tentang Pokemon.